ADOTIC Video, Text, Popup, Banner advertising network details. 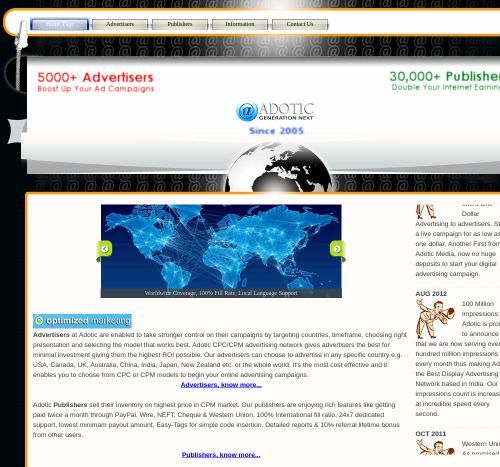 Founded in 2005, Adotic has boosted up campaigns for more than 5,000 advertisers and increase Internet earnings for more than 30,000 publishers. Adotic ensure more powerful control on advertisers’campaigns, giving our customers the best for cost effective investment. Our advertisers can select any particular regions and countries for advertising, namely North America, the UK, Asia Pacific regions, etc,.. Adotic enables you to choose models, CPC or CPM for your advertising campaigns. In CPM market, Adotic Publishers sell their inventory on steep price and get paid twice per month. Customers can blend ads in the themes of the websites, customize any ad suitable for pages’contents and select any sizes, whether it is for texts, videos or images. You can check Adotic reviews on Affbank and ask Adotic Team any question by using the contacts above, especially about how to earn money!